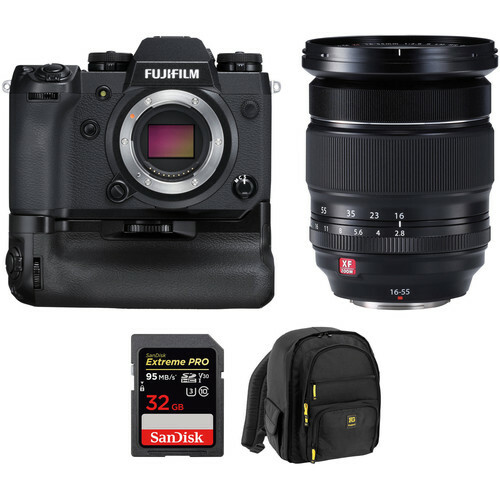 An essentials kit, the FUJIFILM X-H1 Mirrorless Digital Camera with 16-55mm Lens and Memory Card Kit from B&H bundles the advanced mirrorless body and XF 16-55mm f/2.8 R LM WR zoom lens with a memory card and a camera backpack. X-H1 Mirrorless Digital Camera with 16-55mm Lens and Memory Card Kit is rated 4.7 out of 5 by 34. Rated 5 out of 5 by Glenn from Extremely Impressed After decades of shooting both Nikon and Canon, I was very reluctant to switch to a mirrorless system. ?The ergonomics of the XH1 are absolutely fantastic. ?Tried the XT2, just too small for my liking. ?I enjoy the larger size of the XH1. ?Larger grip, larger buttons than the XT2. ? Reminds me of my first Nikon manual camera with better feel in my hands. The quality and performance of XF lenses paired with this body leaves me missing absolutely nothing from the larger and heavier DSLR body and lenses. Kudos Fuji for a premium product! Rated 5 out of 5 by Jose Maria G. from Greatest camera This is the best camera I ever had; I was a Canon shooter (5D Mark IV) and this camera can give me as much quality as my 5D in a smaller package (something considerable for travel) plus I get the advantage of an stabilized sensor an 120 FPS in video. PROS: F-Log is a dream for colorist. JPEGS are great! RAW is great to control the colors amazingly IBIS for los shutter or video is an extra you'll find useful Plenty of custom buttons. User experience; this is weird but it is a pleasure to shoot with this camera, something that never happened to me with any other camera. CONS: Battery life definitely you'll need at least two extra In the Fujifilm system the aperture ring is something you'll always move accidentally Autofocus is not the best in the market. Only 15 min recording time without the battery grip (I like/need portability so o don't have the grip). Rated 5 out of 5 by Chris from Very Nice I have the Xh1 with the fuji 23mm f1.4 lens, A very nice combo. I Use it primarily for video, and the footage with the lens is very sharp and nice. The Xh1 is so customizable, but so much is set up already for ease of use. for daytime sunny or cloudy, I use K6700 white balance with Provia standard film stock, and the colors just pop on footage right out of camera. The highest bitrate at 200 makes very big files, so I use the 100 bitrate at 4k 24p and the footage looks really great. The camera is well built and Made In Japan! NOT China! the IB stabilization is why I finally pulled the trigger and got the XH1not to mention that the colors out of camera are so much better than Sony a7sii (which I also own) . With the 1.4 lens, lowlight video is very nice, not quite Sony a7sii or JVC Ls300 (which also has great color and integrates well with the fuji footage) but better than GH5s for lowlight. The XH1 is a high quality, easy to use camera, with great video in day and night shooting. finally a fuji I'll want to hang on to! Rated 5 out of 5 by Carl from A gem Despite bashing by many photobloggers, this camera is a true gem and the foundation for a great system of lenses. I love being able to switch from shooting stills to movie mode with one selector on the camera body rather than jumping into Live View like my D750 made me do. The camera is very quiet, the ergonomics quite good (the focus selector seems out of place, perhaps because I'm accustomed to the D750's. I love being able to select a focus point any where on the frame, a limitation on the D750. The Eterna and Across simulations are wonderful. The auto focus is great and I look forward to using it on video work as I'm a one-man production team. This makes life easier for me. The IBIS is good but don't expect it to replace a gimbal. It is probably the most disappointing part of this camera; much touted but in practice is more of benefit to the stills side of its being. Rated 5 out of 5 by David L. from Fuji’s best A lot of online reviews have been lukewarm about this camera, claiming it to be a minor upgrade from the XT2 (which is the camera I upgraded from). I respectfully disagree with that opinion. This is a beautiful camera. It has all of the XT2’s mojo but with better handling (a much improved grip), and superior ergonomics. I’m a 70% video / 30% stills kinda guy so the IBIS, slow-mo, F-log internally and 200 MBPS data rate all made the upgrade worthwhile. I love this camera. Rated 5 out of 5 by Ed from Very pleased AF Focus is snappy. Color renders beautifully. EVF feels very natural and seeing exposure before taking the shot is huge advantage over a DSLR with a mirror!? Video looks great. Film simulations is incredible. Battery life isn't stellar, but I've been using EVF only when up to your eye and it seems to go longer and it responds as quick as I'd like when I raise it to shoot. Batteries are fairly inexpensive so having extras for a longer shoot isn't a big hardship. Low light images are impressive. I was hesitant to not get a full frame camera. After shooting with it in lower light/higher iso situations, that hesitation is unfounded.? I'm loving it so far and the only glitches I've had are related to me not being familiar with the settings yet. I'd highly recommend. Rated 4 out of 5 by bdcolen from Another Fuji X winner I teach documentary photography; I shoot professionally; and I have been all in with Fuji for about the past four years - I now have a pair of X-Pro2s, and XT2, and an X100f. And now I have an H1 as well. I love the XPro2s and like the XT2, but the H1 has one feature I have wanted and needed for some time, and that is in-body image stabilization. I don’t shoot video, so whatever 4k video is, I don’t need it. But IBIS is worth the price of admission. Without it, things start to get hinky at 1/60th of a second or below. With it, I can shoot at an 1/8th or 1/4 of a second. Also, there is no question that the auto focus speed, and accuracy is somewhat improved, and the accuracy of the continuous autofocus is markedly improved. At the same time, the electronic viewfinder seems to be brighter and smoother; at least that’s my impression. Yes, the H1 is bigger and heavier than the XT2. Frankly, I like the much deeper hand grip, and the camera size is better for my relatively large hands - it’s still a small camera by non-Fuji X standards. So should you buy an H1 if you’re happy with your XT2? Yes, IF...IF you need the video; IF you need the IBIS; IF you need the improved continuous AF. Otherwise, save yourself some money and wait for the rumoured XT3 which supposedly will have a new sensor. Rated 5 out of 5 by Fugitt from Nice upgrade from X-T1 The X-H1 was an attractive upgrade for my X-T1 and small stable of Fujifilm lenses. I especially appreciate the in-body stablization, larger easier-to-handle body, and small top LCD. I don't miss the dedicated exposure compensation dial - I didn't use it much and the replacement dedicated button + command dial is just fine. The one cautionary from my point of view is the hair-trigger shutter release. It is very much a feather-touch and although manageable, I don't understand the need for such a sensitive control. I will almost always take a few unintended exposures in any given session. Among my favorite photographic characteristics of the X-H1 is its enhanced ability to prevent highlight overflow with the new (for me) "D Range Priority" setting. With this one set to Auto, the raw files have tremendous scope for adjusting overall tonal range and highlight detail during development. Can an external monitor work with the XH1? I dont see an AF-L button on the back of the camera. Is there one? Fortunately, like most other sophisticated digital cameras, you can reassign buttons to do what you want them to do. In this case, you can change the AF-ON button (or any of the other reassignable buttons) to AF-LOCK and achieve back-button focus. Does it brand new camera? Yes, the FUJIFILM X-H1 Mirrorless Digital Camera with Vertical Grip and Accessories Kit, B&amp;H # FUXH1BKACK, is a brand new camera. Is it still made in Japan, currently (2019) ? Yes. I ordered this X-H1 with vertical grip kit on 27th Feb 2019. It has marking &quot;Made in JAPAN&quot; back side of lcd monitor. Is the f-log signal 4:2:2 10bit or 8bit? Does it change if it's internal or external recording? Absolutely amazing combination. The AF-C tracking on the H1 is hugely improved over previous models, and the 100-400 lens itself focuses super quickly. And it's razor sharp. For really wild game consider adding the TC 1.4. You lose one stop, but not a thing in sharpness, and end up with the FF equivalent of 840mm. To clarify, does this kit come with 2 Fuji NP-W126S batteries, or 3? (1 with camera body, 2 with grip)?Plus 1 Watson battery? The Body Plus Grip KIT, comes with a total of 3 batteries. I have an xt2 and a few lenses that have image stabilization. What happens if i use an IS lens on an IS body? Excellent question. The X-H1 uses whichever IS method it deems best suited to the movement it detects in the 5 axis system. Sometimes lens IS is more effective, sometimes body, sometimes a combination of both. The camera does what it needs to for maximum effect.